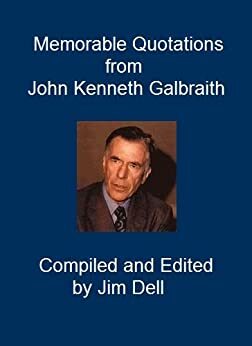 John Kenneth Galbraith (October 15, 1908 – April 29, 2006) was a Canadian-American economist. He was a Keynesian and an institutionalist, a leading proponent of 20th-century political liberalism. His books on economic topics were bestsellers from the 1950's through the 2000's and he filled the role of public intellectual from the 1950's to the 1970's on matters of economics. A short book but no less valuable for that. Just about every quotation is pithy, relevant to today and frequently amusing. This man is sorely missed. I can only hazard a guess as to what his comments would be on the US politics of today - highly critical I would imagine. Galbraith has a way with words and calls things as they are. In his writings, he sometimes takes too many words to get to his point. That is why a listing of quotations for Galbraith is such a good idea. Unfortunately, this book is repetitve, listing the same quotations several times and doesn't have all that many quotations. Yet Galbraith has so many good ones from which to chose.